Bringing to light “the Brightside of Cannabis” along with its beneficial properties is our philosophy. In recent studies, Medical Cannabis has been used to treat patients with diseases such as Cancer, Parkinson’s, Crohn’s, Alzheimer’s, Multiple Sclerosis, Epilepsy, Chronic Pain Management, Anxiety, Depression, Autism, and Post Traumatic Stress Disorder. Our team of scientists is comprised of licensed healthcare professionals from the full spectrum. Ranging from Medical Doctors and Ph.D.’s on our Medical Board, lab testing conducted by California State licensed Clinical Laboratory Scientists (CLS) and Clinical Chemists (CCS), and Quality Management programs regulated by licensed Bioanalysts to ensure overall accuracy. Brightside Scientific is dedicated in providing the industry with quality testing that will be the benchmark for all Cannabis laboratories. Unlike your average cannabis testing facility, Brightside Scientific operates under the same testing guidelines set forth by CLIA (CMS) and CAP used to regulate high complexity testing laboratories. Our lab uses HIPAA standards to maintain Client Confidentiality Information (CCI) and ensure privacy protection for record retention on all reported tests only accessible to ordering clients. We also apply Six Sigma management tools to make sure our laboratory utilizes high standards to eliminate any errors or deviations from routine work. Our staff is trained to apply QA/QC checks from pre-analytic to post-analytic steps and signing off on all documents and passing QC before releasing any results. 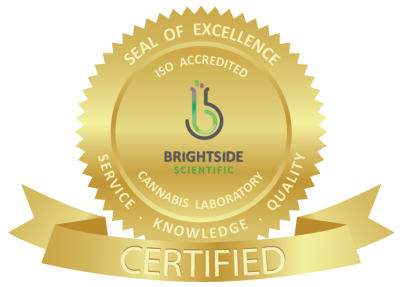 At Brightside Scientific, we have a team of scientists that will perform testing in compliance with ISO/IEC 17025:2017 and the Bureau of Cannabis Control for the State of California. ISO/IEC 17025:2017 is the main standard used by Cannabis Testing Laboratories. It adds the idea of competency to the calculation and it facilitates laboratories to produce results on quality tested and calibrated instrumentation following firm regulations. At Brightside Scientific, methods are created on advanced and high technology instruments by our team of scientists. The high supply will require high demand of labs to be able to test efficiently and productively, our team of scientists will measure samples using highly advanced methods on clean final products with the highest sensitivity. Clients with wholesale production and distribution will find reliable turnaround times with Brightside Scientific.